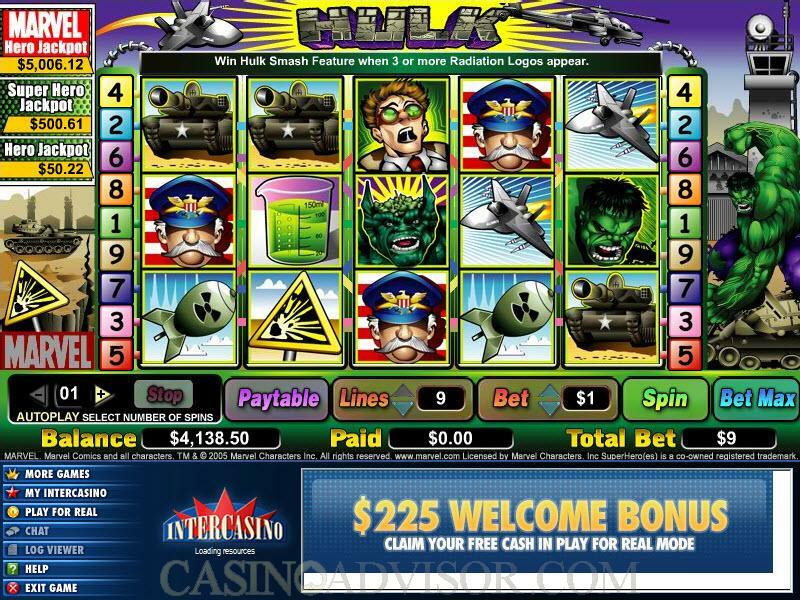 The Hulk is a video slot from Cryptologic. It has 5 reels, 9 paylines and a maximum bet of 9 coins. 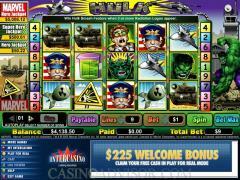 The slot game is from the branded Marvel series which is based on Marvel Comics superheroes. 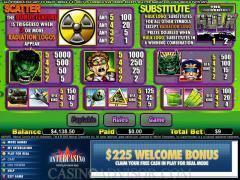 Fans of the Hulk will love the slot game because the symbols on the reels will mean a lot more to them. The Hulk of course is there. So is Bruce Banner the physicist who transformed into the Hulk by radiation from a misfired experiment. The Abomination is one of the enemies of the Hulk. The Policeman is one of the symbols. Other symbols are elements often found in the Hulk comics and include the Tank, the Airplane, the Missile, the Radiation Sign, the Beaker and the Test tubes. The Incredible Hulk Logo is the wild symbol. The Radiation Logo is the scatter symbol. Before starting the game players will have to choose the coin denomination by operating the arrows next to the coin denomination button. The coin denominations are 0.05, 0.10, 0.25, 1.00, 2.00 and 5.00. Players will also have to enable up to nine paylines. The paylines can be activated by operating the arrows next to the LINES button. Winning combinations pay only if they occur in enabled paylines. In The Hulk players can wager only one coin per payline by default. Once the settings have been completed the game can be started by clicking the SPIN button. The Incredible Hulk Logo is the wild symbol. It doubles payouts when it substitutes to make a winning combination but does not offer a fixed jackpot. The highest fixed jackpot of 5000 is offered by The Hulk symbol. 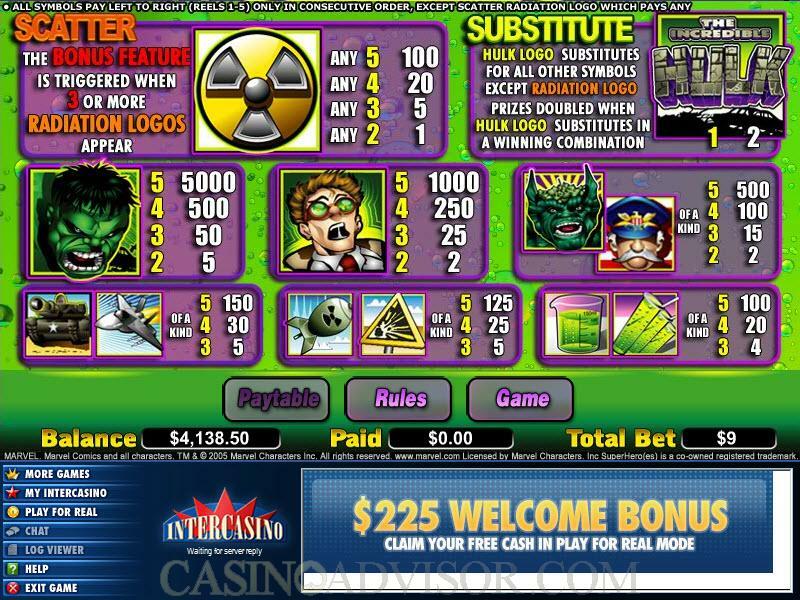 Two or more Radiation Logo scatter symbols result in scatter payouts. Five scatter symbols have a payout of 100 coins. Three or more scatter symbols trigger the bonus feature on the second screen. In the bonus feature the Hulk must destroy the chosen machinery, tank or helicopter, and also locate and destroy the secret weapons laboratory. Players earn bonuses when the Hulk smashes the machinery and when he destroys the laboratory. The Hulk has a life meter that keeps diminishing as he sustains damage. The bonus game continues till either the laboratory is destroyed or the Hulk’s life meter is over. The Hulk is linked to the Marvel progressive jackpots. These jackpots are triggered randomly. No sequence of events on the reels is required. The larger the bet the greater is the chance of hitting the jackpot. The largest jackpot is the Marvel Jackpot which starts at $5,000. Next is the Super Hero Jackpot, which starts at $500. The smallest jackpot is the Hero Jackpot which starts at $50. Interested in reading more detailed information about The Hulk? If so Click Here for more details.